Kargos is a port of Argos and BitBar that allows you to create custom plasmoids quickly. Argos is a Gnome Shell extension that turns executable scripts' standard output into panel indicators and dropdown menus. It is inspired by, and fully compatible with, the BitBar app for macOS. 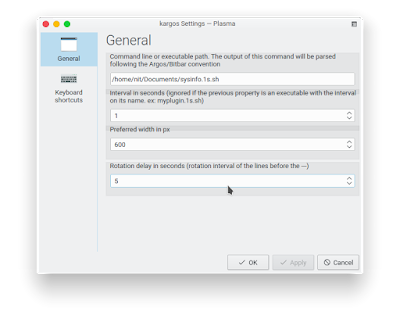 Argos supports many BitBar plugins without modifications, giving you access to a large library of well-tested scripts in addition to being able to write your own. 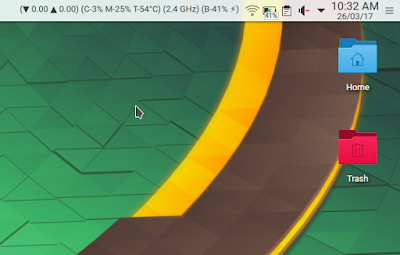 An alpha release of Kargos is available at kde-look, allowing you to directly install it from your desktop panel by choosing "Add Widgets" and "Get New Widgets". Download the SysInfo Plugin, add Kargos to KDE Panel and right click on the plasmoid. Click on settings and add full path to the plugin's location in first field as shown in screenshot below. Click on apply. Now you should see plugin working on your panel as shown in first screenshot. Currently, the plugin updates every second. If you want to increase the update frequency, just change the "1s" part in plugin file name. For instance, "sysinfo.1s.sh" changed to "sysinfo.5s.sh". Note that for each plugin, you will have to add a new Kargos plasmoid on panel, unlike Argos which watches all plugins inside a directory.